We did manage to make it out for sushi last night and also had the pleasure of watching two different tourist parties try to converse with the chefs, and both sides basically make asses of themselves. The beau felt embarrassed for Japan, I felt embarrassed for North America. When first asked if they could speak any English there was a resounding no from the chefs, until the head chef ordered them to speak English, which resulted in them upping the level to "yes" and "OK". There was some back and forth about rice, I can only guess one of the customers wanted a bowl of rice..."rice"? "sushi rice"? "sushi rice!!" went the exchange. In response to one of the tourist's explanation that they weren't very dexterous when it came to the old chopsticks, they were served chawan mushi which can be eaten with a spoon and personally, makes me want to gag. I don't know what it is about the steamed egg custard with a surprise inside, but it's not the first thing I would serve to someone who can't use chopsticks (using my Sherlock Holmes intuition, I'd say such a person has probably not eaten a lot of "oriental food"). There really is no good way out of a situation like that and I don't mean to be scornful of either side-it's just amusing to watch. California rolls were also ordered, and despite not being offered, were generously made. This made me smile because I'm finishing up a fantastic book about the history/economy of sushi in which the california roll is discussed and really, how would someone not know that the ubiquitous roll served at their local Japanese restaurant in Smalltown is not in fact, from Japan. The beau's brother is a sushi chef whose knowledge of English goes no further than the English name for every fish he has ever cut. We have great discussions about food in Japan and overseas and when I first went to his restaurant he told me with a mischievous grin that whenever he gets tourists in front of him he makes a hell of a lot of salmon nigiri. Instead of the Mandarin Bar as promised, we ended up at Rigoletto Kitchen in Ginza which has got to be one of the only places open late (or at all) on Sundays in that area. It looked a lot more upscale on the website but turned out to be not unlike La Boheme or similar chains that turn out "European" food and are classy enough that you don't feel like you're at a family restaurant but if you look closely (or not so closely come to think of it) at the food and other details realize it's nothing like the sleek website with dark and edgy photos and more of a family restaurant with mood lighting. Luckily we weren't there for the food but on a research expedition to check out Heineken's Extra Cold beer. Lured in like the other Japanese masses by a spot on a food show, we wanted to try this beer that was cooled to below 0 (C) and supposed to freeze your throat upon contact. 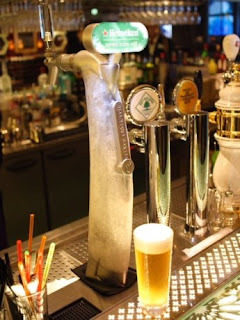 Given a prominent place on the bar, the pleasure-giving tap looked positively Arctic! Holding the glass in my hand didn't make me scream out in cold though, so I was suspicious as I took a sip. Smooth and icy cold but not the frozen experience I had been looking for. I was expecting a thin film of ice to form from my tongue down to my stomach and was bitterly disappointed when it didn't. Icy cold and tasty yes, but not the fireworks I had been expecting. Perhaps a comparison with an ice cold Asahi would have been prudent at the time but I won't be running around town to find a place that serves it in the future.